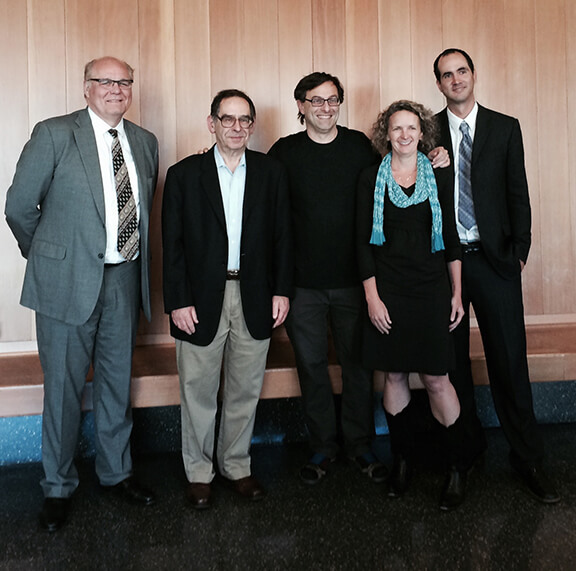 BrainMIC Speakers (left to right): James Sharp, Steven Martin, Ehud Isacoff, Holly Aaron, and Sharif Taha. The BRAIN Initiative has spurred the rapid development of new optical tools to precisely measure and manipulate neuronal activity. These powerful tools are an important and exciting step toward deciphering the neuronal circuits that command essential brain functions, such as perception, movement, and memory. The mission of the Brain Microscopy Innovation Center (BrainMIC) is to provide the technology and training required to make new optical tools accessible to the broad neuroscience community. The BrainMIC is a new public-private partnership between UC Berkeley and ZEISS Microscopy, LLC, one of the leading microscope companies in the world. The BrainMIC Grand Opening was celebrated on Thursday, May 28, 2015. Speakers included Ehud Isacoff, Director of the Helen Wills Neuroscience Institute, Holly Aaron, Manager of the BrainMIC, James Sharp, President of Carl Zeiss Microscopy, Steven Martin, Dean of Biological Sciences, and Sharif Taha, Science Program Officer at The Kavli Foundation. Using novel approaches developed at UC Berkeley, the BrainMIC will help fast-track the commercial developments of new microscopes, optical components, and analysis methods. The BrainMIC currently houses the three ZEISS microscopes (LSM-880-AiryScan for super resolution imaging, LSM-880-OPO for deep tissue imaging, and LightSheet for imaging cleared tissues with a refractive index ~1.4), and will be procuring additional microscopes in the future. Berkeley researchers will work with ZEISS technical specialists to build new hardware and capabilities into the existing microscopes from ZEISS. These new imaging systems will be standardized for production and will ultimately become available for purchase. For example, one important technological development is to enable patterned stimulation of neuronal activity. With this ability, researchers could investigate how a particular sequence of activation affects output at the level of a single neuron, a system of neurons, or animal behavior. This will require the addition of spatial light modulators to deliver rapidly modulated three dimensional light patterns that are strong enough and focused enough to precisely stimulate neuronal activity. Such systems have been developed in the labs of individual researchers, but none are commercially available. In addition to training Berkeley researchers to use our nascent imaging systems, the BrainMIC will open its doors to researchers from other universities. Starting in January 2016, the BrainMIC will provide an annual winter course. The advanced techniques courses currently provided at Cold Spring Harbor and Woods Hole Marine Biological Laboratory have been very successful in educating and inspiring young researchers, but there is no such course on the West Coast. The BrainMIC’s “4D Advanced Microscopy of Brain Circuits Course” will focus on the newest BRAIN Initiative neurotechnologies, utilizing both turnkey and innovation platforms that are new and not yet commercially available. Enrollment will be limited to a maximum of 16 students who will receive training from 16 Berkeley faculty. ZEISS will provide several microscope systems to use during the course, as well as technical specialists to help run the systems. We encourage graduate students, postdocs, and early career faculty who are interested in participating in the course to apply. Click here for more information about the BrainMIC Winter Course and instructions on how to apply. Unable to participate in the winter course? Consider attending the annual three-day Advanced Imaging Workshop that has been taught at UCB for the last 12 years with support from 15 key US companies. Questions about the BrainMIC? Contact us at brainmic@berkeley.edu.